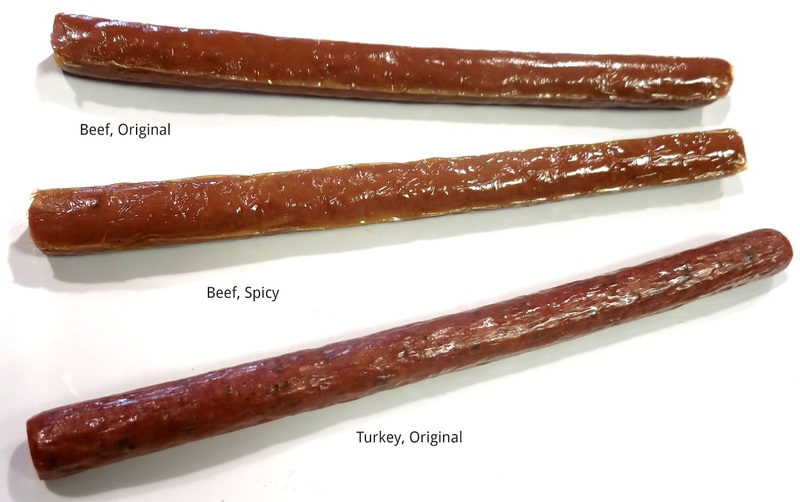 The New Primal recently announced its new line of beef and turkey sticks. 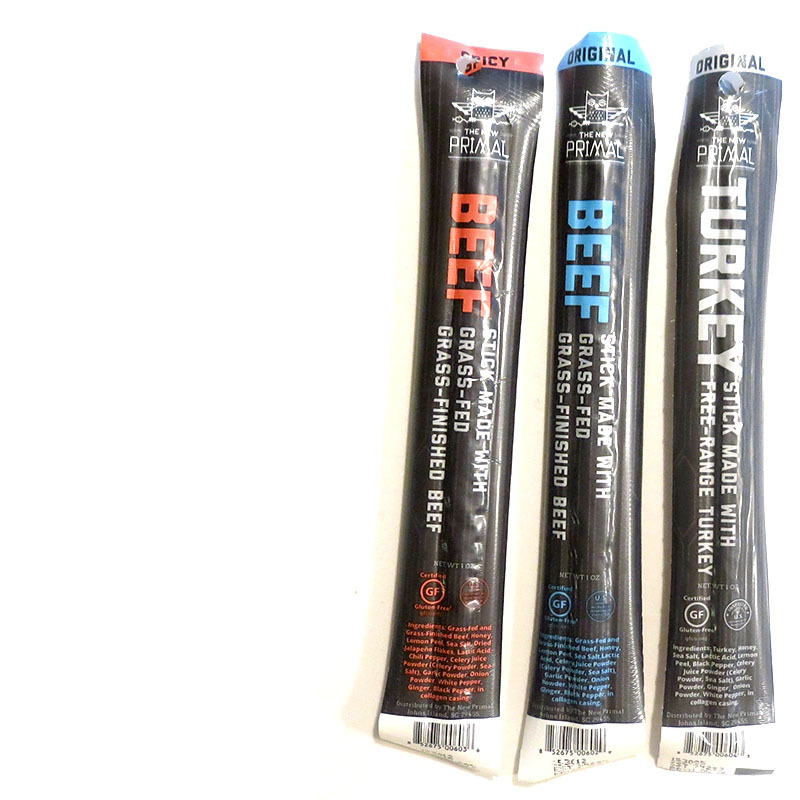 We previously reviewed their beef jerky a couple of years ago (see link here). 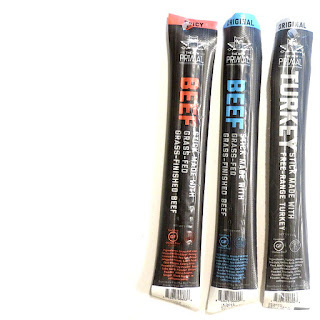 These new meat sticks are made from grass-fed beef and free-range turkey. They are also claimed to be gluten-free, Non-GMO, soy free, free of hormones and antibiotics, and paleo friendly. The company also claims that they are made from 100% beef and 100% turkey. The New Primal got its start in 2009 when Charleston, SC-based Jason Burke embarked on a quest to make snacks suitable for his active and healthy lifestyle. He picked up on the paleo-diet, and soon launched his own brand of meat snacks and trail mixes. Beef, Original: Grass-fed and grass-finished beef, honey, lemon peel, sea salt, lactic acid, celery juice powder, garlic powder, onion powder, white pepper, ginger, black pepper, collagen casing. Beef, Spicy: Grass-fed and grass-finished beef, honey, lemon peel, sea salt, dried jalapeno flakes, lactic acid, chili pepper, celery juice powder, garlic powder, onion powder, white pepper, ginger, black pepper, collagen casing. Turkey, Original: Turkey, honey, sea salt, lactic acid, lemon peel, black pepper, celery juice powder, garlic powder, ginger, onion powder, white pepper, collagen casing. Beef, Original: The first flavors to hit the tongue is a smokiness, followed by a light salt and a tangy presence on the palate. It's a mild taste profile overall, with a light natural meat flavor. There's no significant spice to speak of. Compared to national brands of beef sticks, it's much more mild in terms of spice, but offers up more natural meat flavors. Whereas many national brands have a "summer sausage" flavor, this stick tastes more light and clean. It bites off with a crisp "snap", and presents a soft, moist chewing. It tends to feel like finely ground beef, with a good deal of meaty texture. Handling is quite oily, however. Beef, Spicy: The first flavors I pick up is very much the same as the Original. I do, however, detect a weak spiciness that slowly develops into a light bit of heat. The taste is perhaps a touch more bold than the Original, but it's still lighter, and cleaner in flavor than most national brands of meat sticks. I'd rate the heat as "mild medium" on my personal heat scale (level 2 out of 5). While I can agree this is "spicy" compared to the Original, it's still too mild for my preference. The meat consistency and chewing is very much the same as the Original. Turkey, Original: The first thing I taste in this is a light turkey meat flavor, mixed with a light salt and tanginess. The tanginess is quite well defined, mixing with the honey to create something comparable to a "honey-lemon" flavor. This stick is also more peppery than the company's beef stick offerings. Overall, it's a meaty flavor, with a honey & lemon liveliness, and some black pepper to throw in. The meat consistency is more solid, more chewy, and bit more dry than it's beef counterparts. It actually chews and feels like most national brands of meat sticks. It doesn't quite have the "snap" that the company's beef varieties have, but handles quite clean in comparison. These new meat sticks from The New Primal definitely taste different than the national brands of meat sticks, mostly as having a cleaner flavor profile. The two beef varieties are actually light on flavor, but much more moist and tender. The turkey variety has a bolder flavor, more peppery, tangy, and sweet, but being more dry and chewy. 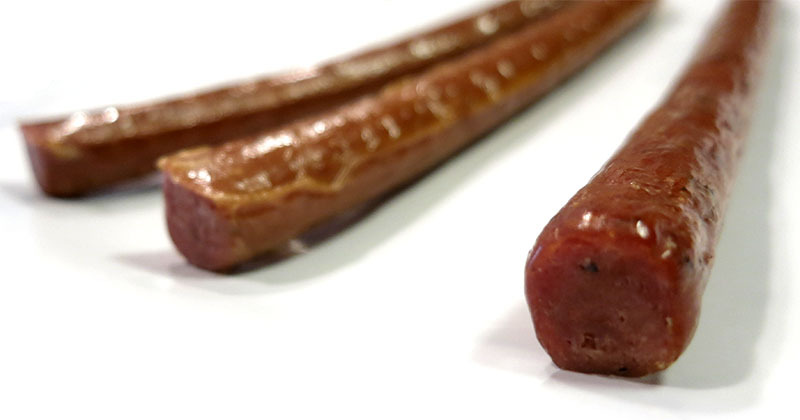 The two beef sticks have a very meaty chewing texture, offering the feel of finely ground meat, as opposed to the mush of many competing brands. Considering The New Primal is marketing itself as being natural, healthful, and part of a paleo diet, they are actually pretty good compared to others in the same genre. My personal favorite between these three, is definitely the Turkey, for its bolder flavor, cleaner handling, and its more dry, chewy, texture. The New Primal beef and turkey sticks were not that good. The flavors were decent but in my opinion the texture needs work. They were very mealy and gritty. The sticks I tried were a free sample. They were not wroth the calories.